NASA is getting ready to send astronauts on yearlong missions to the International Space Station, doubling the duration of a typical orbital stay. These long-term missions will be sending spaceflyers into largely uncharted territory, and some of the biggest unknowns are how the human mind and body will react to that much time in space. NASA has long known that weightlessness wreaks havoc on the body, with astronauts losing muscle mass and bone density, and even suffering eyesight degeneration, after spending time in space. "While it's definitely new territory for NASA, I wouldn't expect the challenges of a yearlong mission to be substantially different from those of a six-month mission," said former space station commander Michael Lopez-Alegria, who is now president of the Commercial Spaceflight Federation. "A yearlong mission will be beneficial to Human Research Program scientists as they continue to expand the envelope of human spaceflight so that one day we can undertake the longer missions that we think will be necessary to voyage beyond cis-lunar space," or the region between Earth and the moon. And the health risks are just one side of the challenge. Psychologically, the isolation and confinement of life on the space station can be tough to deal with as well. Though exercise machines installed on the space station can mitigate the body issues, and phone calls and emails home can help the mind, both of these problems should be more severe for crews spending twice the normal mission length in orbit. "For the crew, the biggest challenge would be psycho-social," another former space station commander, Leroy Chiao, wrote in an email. "It is difficult to be away for a long period of time. 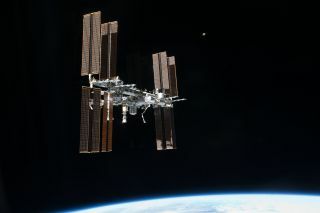 Fortunately, the ISS features excellent communication tools for crews to keep in touch with friends and loved ones." Though some cosmonauts spent a year or longer on previous space missions to the Russian Mir station, no one has ever lived for a year at the International Space Station. The first ISS yearlong crew will be NASA astronaut Scott Kelly and Russian cosmonaut Mikhail Kornienko, who are due to launch in 2015. Kelly, a former U.S. Navy test pilot with combat experience, said he thinks he's up to the challenge. "We have a really good group of people here, the behavioral health and performance group, that works with us to try to mitigate the psychological impact of being away from home and isolated for a long time," Kelly told SPACE.com during an interview earlier this month. "I kind of recognize what I need in that regard and what I can do to make it better." And as for the risk to his bodily health, Kelly said he's prepared to take it on. "I'm not a big worrier, but I certainly understand that there is more risk," he said. "But in anything I've done throughout my career — flying aircraft as a test pilot — there's risk and reward, and you have to weigh the risks, and I think it's worth it."